This is a REVISITED VERSION of the review I did a while ago! I've put in some new, better pictures, and re-wrote parts of the article. If you like what you see, be sure to leave a comment, and I might do this more often! 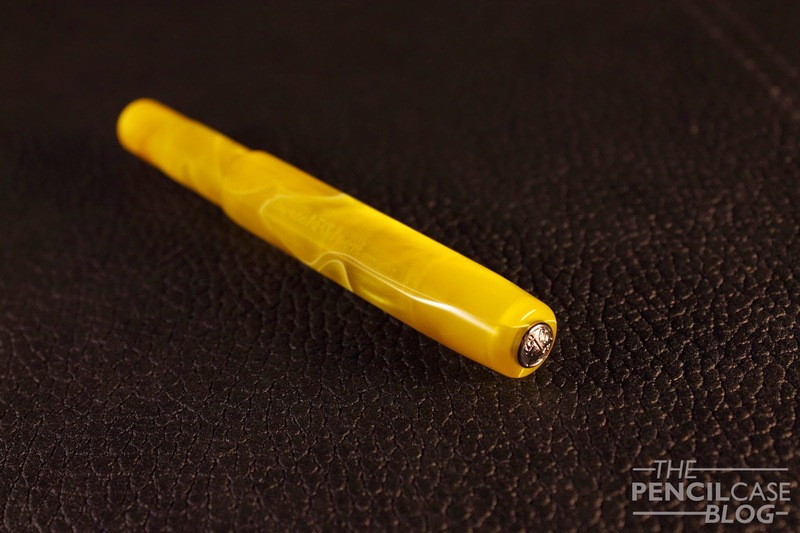 Ok, everyone knows the 'sport' series from Kaweco, but this is one you might have never seen before! I was really exited to try this pen, because I never saw one in real life either! And I must say it is even better than it looks in the catalogue or on the internet. Obviously, the first thing that comes to mind when you open the box is: WOW! That is one very bright yellow pen. It really pops, but it doesn't look cheap at all. In general, I'm not a fan of brightly coloured pens though, but this one... 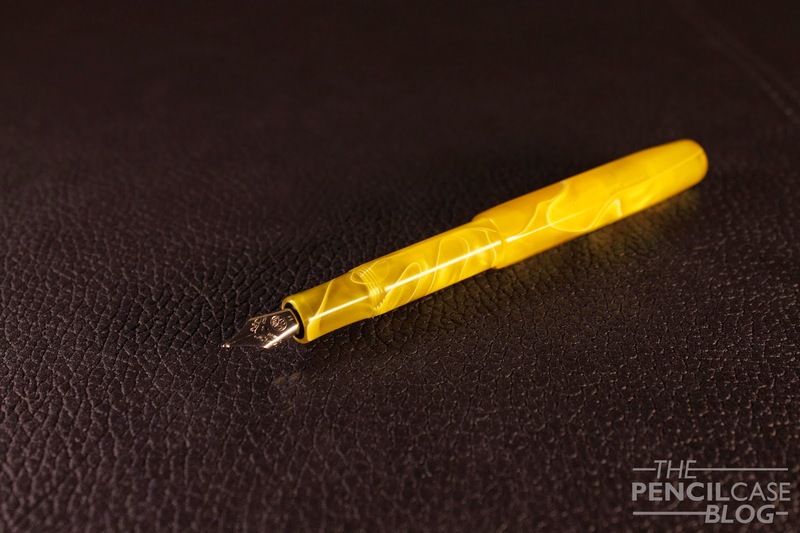 The yellow swirl acrylic is amazing, it is machined inredibly thin, and therefore very lightweight (about the same weight as a Classic sport fountain pen) and somewhat transparent. The opaque white swirl gives it some nice depth, it is really fascinating to look at! The nib is -as always- very good. 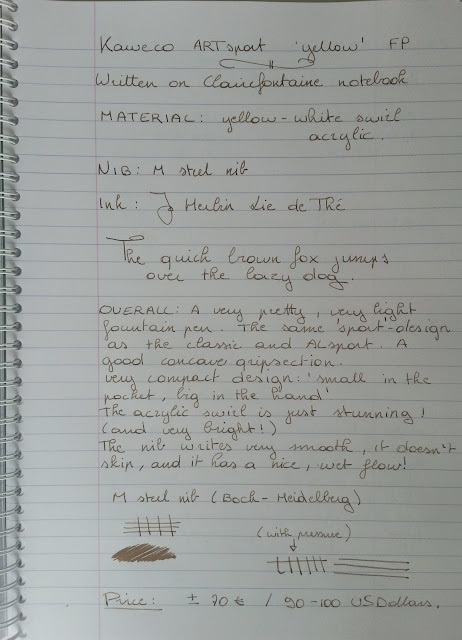 I have had quite a few Kaweco sport fountain pens now, and there hasn't been a single one that doesn't write smooth, wet and without skipping! I have five Kaweco fountain pens and my dad has one, and we never, ever had any trouble with the nibs not functioning properly, so I guess you can't really go wrong with them. Another cool thing about the AL, AC, ART pens, is that you can remove the entire nib and feed unit, so you can easilly get another nib size, without having to buy an entirely new pen! Another thing I really like about the Sport series, is their concave-shaped grip section, I really like it, it makes for a good and comfy grip. There are various designs and colours available (there is also a ballpoint available in some colours), there are some with gold trims and some with silver trims (like this one). They are a bit more expensive than the ALsport series, at about 90 Euros/ 120 USDollars, and Kaweco has recently discontinued this collection. 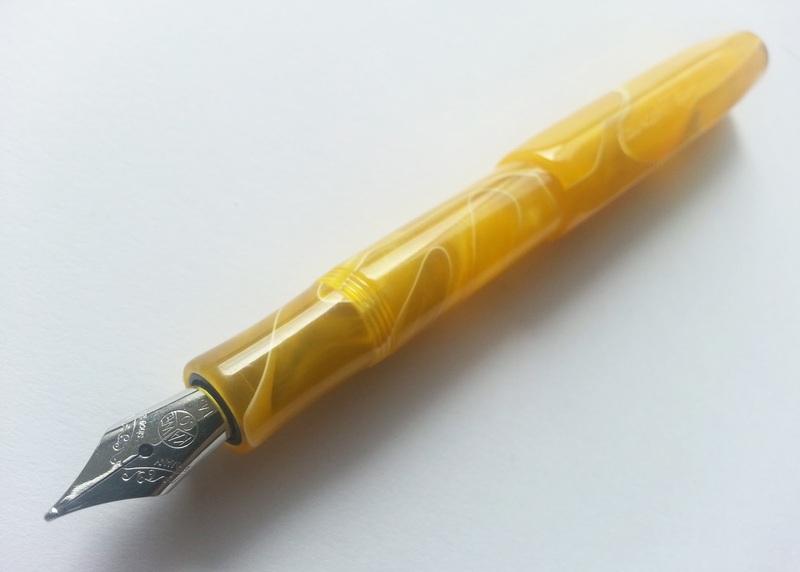 If you like really bright colours, or you don't like the weight of the ALsport pens, this might be a perfect pen for you! But if you want one, be sure to pick one up now, because they are quite rare to find, and as I said, they will become even harder to find in the future! 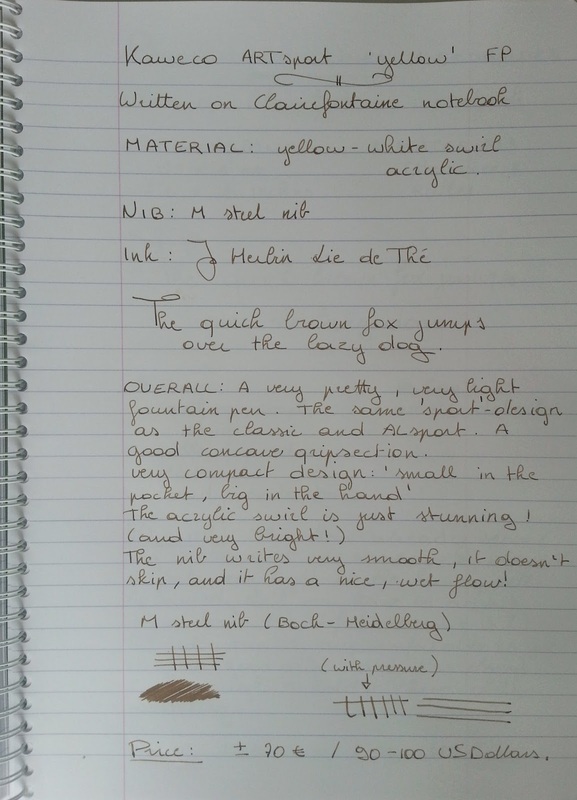 Note: this pen was sent to me by Kaweco, so I could write this review. I was in no way influenced in the making of this review, the opinions shared in this review are completely my own!